This is the message received by users. Apple’s apparently taking its “fire drill” approach to pushing the iPhone XR and XS seriously. 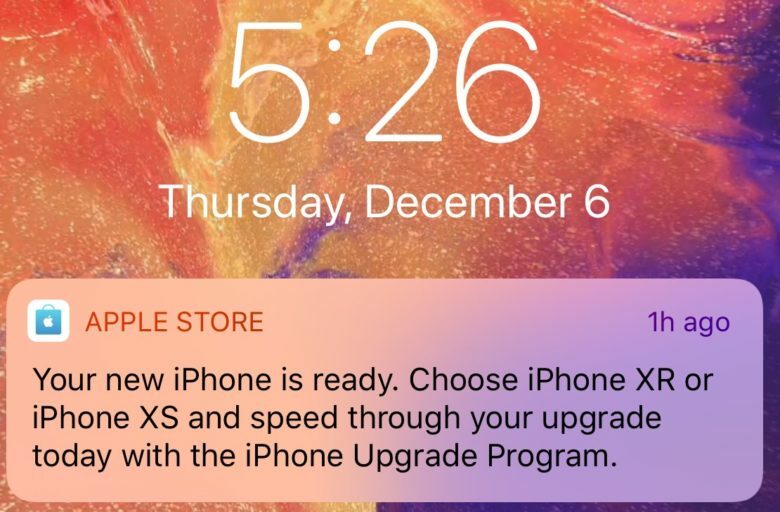 As noted by developer Steve Lederer on Twitter, Apple recently sent out a push notification prompting users to upgrade to the iPhone XR or XS. This was sent out to people on Apple’s iPhone Upgrade Program, so it’s not really breaking Apple’s own App Store rules stating that apps should not send unsolicited spam to customers. However, it’s also not the kind of soft sell we’d usually expect from Apple. This ties into a recent report that Apple is being far more aggressive about pushing its new iPhones. This comes at a time when the overall smartphone market is slowing, and Apple is being hit with reports that its new iPhones are selling in disappointing numbers. As a result, the company is pushing very un-Apple ads promoting reductions on its iPhone XR, via the buyback program. It has also reportedly moved marketing staff from other projects to try and come up with ways to sell more iPhone XR and XS units. Ultimately, anyone clutching their pearls because a company that sells products is being aggressive about selling product is probably being a bit overdramatic. It would be easy to understand people’s annoyance if Apple starting send iPhone XR push notifications to every user — regardless of whether they had expressed interest in upgrading. That’s not happening right now. Given the outrage that occurred when Apple last pushed something (a free album in that case) to all its users without asking, I don’t see that happening any time soon. But as another data point in Apple’s overall change in strategy? This is definitely interesting.